Arthritis occurs when the cartilage within the joint becomes damaged. In a normal cat, each joint contains cartilage that acts as a buffer between the bony surfaces. The cartilage creates a "cushion" between the bones that form the joint. When the cartilage within a joint becomes damaged, a cascade of events is unleashed which eventually leads to the destruction of the cartilage. Once the cartilage within the joint is destroyed, the two bones will rub together because there is no longer a cushion between them. When this occurs, the bones will become damaged resulting in arthritis. Feline arthritis is more common in middle-aged and older cats. Cats that are obese are more likely to be affected by the signs of arthritis than a cat that is lean. Joints that have been injured in the past are also more prone to becoming arthritic later in life. Congenital abnormalities that result in abnormalities within a particular joint can make your cat more likely to suffer the effects of arthritis. Hip dysplasia is an example of a congenital abnormality that can lead to arthritis. A cat that is arthritic may show many different symptoms. Essentially, arthritis causes pain. The symptoms that result from arthritis are a result of that pain. Some cats become less active and may sleep more than normal. Other cats may become anxious and restless. Some cats have difficulty finding a comfortable place to rest or a comfortable position in which to sleep. Some cats become irritable and begin to avoid contact with family members. Other cats become more social, seeking out more interaction with family members. Cats with arthritis may be painful when handled. 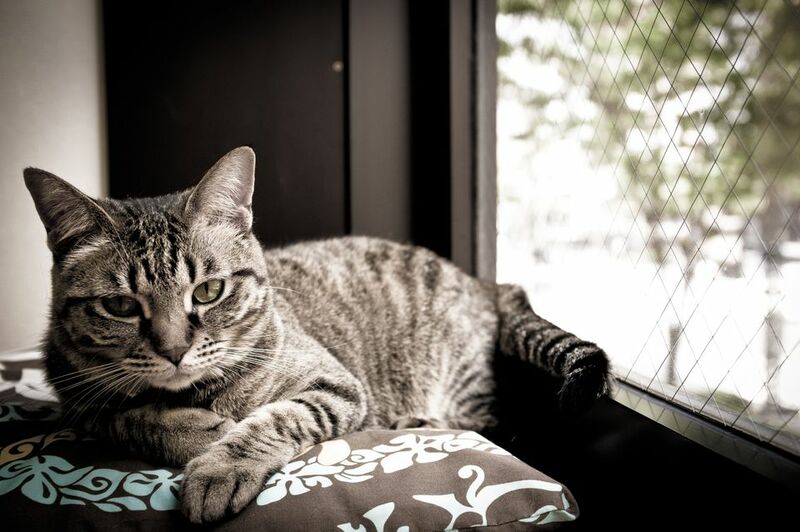 Arthritic cats may have difficulty accessing the litter box and may urinate or defecate outside of the litter box. Some cats with arthritis will stop grooming themselves, resulting in an unkempt haircoat. The pain resulting from arthritis may cause a decreased appetite for some cats. This, in turn, may result in weight loss. Lameness may be present but is often difficult or even impossible to notice. Some cats become quite good at hiding the symptoms of their pain. The symptoms of arthritis in cats can be gradual and insidious in onset. Knowing the behaviors that are normal for your cat and monitoring for changes in those behaviors will provide a good base for determining whether your cat is painful. If in doubt about whether your cat is painful, it is advisable to assume that pain is present and act accordingly. Cats that are painful as a result of arthritis need to be treated to relieve their pain. If you suspect that your cat has arthritis, schedule an appointment with your veterinarian. Your veterinarian will be able to determine whether your cat has arthritis by performing a physical examination on your cat and by taking radiographs (x-rays). In some situations, your veterinarian may also want to evaluate joint fluid from your cat to help rule out joint infections. Once arthritis is diagnosed, there are a number of feline arthritis treatment options that will help keep your cat comfortable and pain-free.